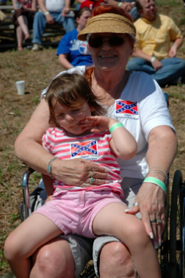 A woman and her granddaughter at the Battle of Selma reenactment sport stickers that read: "We Support Confederate History Month." SELMA, Ala. — Fake guns go off like firecrackers on the Fourth of July. But there’s no cheering here, not from the crowd gathered at the edge of this field in Selma, Ala. They’re here to watch the Civil War reenactment up ahead. Many are seated in lawn chairs, others on wooden bleachers, or blankets. For this crowd, this is no occasion for a hooting, howling good time. This is serious. This is important. This is their moment to experience history. Their history. Confederate History Month — What are its enduring lessons? Slavery? States’ rights? Comments welcome! I’m glad the artificial suppression of education about the Civil War will have a temporary lull in Virginia. Even if the only issue were shutting up racists it’s still not a good idea to abridge freedom of speech. i.e. If we allow flag-burning as an example of free speech we should allow criticism of flag-burners. Our political correctness has run amuck if we can’t honor those fallen. Maybe the virus that attempts to silence those who admire or are sympathetic to the confederacy has run its course and the fever is broken? What most concerning about the Governor’s proclamation is the racial subtext. The proclamation has been carefully crafted to appeal to racial conservatives by recasting the history and meaning of the Civil War. It’s a symbolic gesture imbued with coded meanings that should not be excused simply on account of the facially race-neutral language.